Astronomers at the California Institute of Technology announced Wednesday that they have found new evidence of a giant icy planet lurking in the darkness of our solar system far beyond the orbit of Pluto. They are calling it "Planet Nine." Their paper, published in the Astronomical Journal, describes the planet as about five to 10 times as massive as the Earth. But the authors, astronomers Michael Brown and Konstantin Batygin, have not observed the planet directly. darkness of our solar system far beyond the orbit of Pluto. They are calling it "Planet Nine." Instead, they have inferred its existence from the motion of recently discovered dwarf planets and other small objects in the outer solar system. Those smaller bodies have orbits that appear to be influenced by the gravity of a hidden planet – a "massive perturber." The astronomers suggest it might have been flung into deep space long ago by the gravitational force of Jupiter or Saturn. Since it is still unknown where (if) it is, and it sits well beyond Pluto, what are the odds of it being intersected by New Horizons as that little probe traverses the Kuiper Belt? About the same odds as that of a banana slug randomly traveling out from the Black Rock Desert and accidentally finding itself passing under the Reno Arch. Where should we start looking for Planet Nine? BMAONE23 wrote: Since it is still unknown where (if) it is, and it sits well beyond Pluto, what are the odds of it being intersected by New Horizons as that little probe traverses the Kuiper Belt? That's the kind of question I like! I don't know what its trajectory after that will be, but I'm guessing it is in that general direction. The most likely spot for Planet Nine would be where it spends most of its time, at aphelion. Based on my initial perusal of the paper and diagrams, the aphelion point for Planet Nine would be a bit west of the perihelion point for Sedna, which is close to RA 6h, Dec 14 degrees, in between Orion and Gemini. That is just about the opposite point in the sky from 2014 MU65. Furthermore, in the direction New Horizons is headed, Planet Nine would be near perihelion, and as they've already said, we would have already seen it if it was that close. So pretty close to zero chance, indeed! But it brings up the $64000 question: exactly where SHOULD we look for Planet Nine? For our nominal simulation, we adopted a' = 700 AU, e' = 0.6, and m' = 10 m⊕, as before, and set the inclination and initial argument of perihelion of the perturber to i' = 30° and ω' = 150°, respectively. But they don't seem to indicate the longitude of the ascending node that they used for it. The ascending nodes for the cluster seem to average around 100 degrees, and since Planet Nine has about the same inclination, and ascends thru the ecliptic at about the same place, it should be similar. But the diagram isn't quite symmetrical, with the ellipse of Planet Nine rotated a bit counter-clockwise from the orientation that would be opposite the average of the cluster. So far based on my best guesses, I figure that the big constellations Hydra and Eridanus and Monoceros would be likely discovery spots, with Orion my favorite in the sweet spot. They said the best bet is that you would be looking towards it in the November sky, I think at midnight. That would be centered at RA 3h or 4h or so. Astrophysicists at the University of Bern have modelled the evolution of the putative planet in the outer solar system. They estimate that the object has a present-day radius equal to 3.7 Earth radii and a temperature of minus 226 degrees Celsius. How big and how bright is Planet 9 if it really exists? What is its temperature and which telescope could find it? These were the questions that Christoph Mordasini, professor at the University of Bern, and his PhD student Esther Linder wanted to answer when they heard about the possible additional planet in the solar system suggested by Konstantin Batygin and Mike Brown of the California Institute of Technology in Pasadena. UT: Did the Sun Steal Planet Nine? Did the Sun Steal Planet Nine? One of the biggest new mysteries in our Solar System is the purported presence of a large and distant “Planet Nine,” traveling around the Sun in a twenty-thousand-year orbit far beyond Pluto. Although this far-flung world’s existence has yet to actually be confirmed (or even detected) some scientists are suggesting it might have originally been an exoplanet around a neighboring star, pilfered by our Sun during its impudent adolescence. In January 2016 the remorseless “planet killer” Mike Brown — a Caltech professor and astronomer whose discovery of Eris in 2005 prompted the IAU’s reclassification of planets, thereby knocking Pluto from the official list — announced evidence for the existence of a “real” ninth planet orbiting the Sun four times farther than Pluto…and possibly even farther out than the Kuiper Belt is thought to extend. According to Brown and co-researcher Konstantin Batygin their Planet Nine may be almost as massive as Neptune, but they’re still on the hunt for it within the regions where they think it should be. Contrary to recent reports, NASA's Cassini spacecraft is not experiencing unexplained deviations in its orbit around Saturn, according to mission managers and orbit determination experts at NASA's Jet Propulsion Laboratory in Pasadena, California. Earlier this year scientists presented evidence for Planet Nine, a Neptune-mass planet in an elliptical orbit 10 times farther from our Sun than Pluto. Since then theorists have puzzled over how this planet could end up in such a distant orbit. 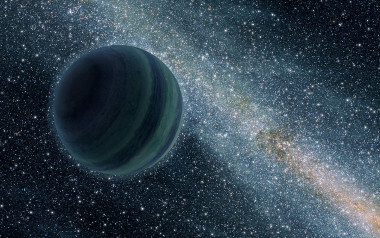 Doum wrote: Through a computer-simulated study, astronomers at Lund University in Sweden show that it is highly likely that the so-called Planet 9 is an exoplanet. This would make it the first exoplanet to be discovered inside our own solar system. The theory is that our sun, in its youth some 4.5 billion years ago, stole Planet 9 from its original star. In the race towards the discovery of a ninth planet in our solar system, scientists from around the world strive to calculate its orbit using the tracks left by the small bodies that move well beyond Neptune. Now, astronomers from Spain and University of Cambridge have confirmed, with new calculations, that the orbits of the six extreme trans-Neptunian objects that served as a reference to announce the existence of Planet Nine are not as stable as it was thought. At the beginning of this year, the astronomers K. Batygin and M. Brown from the California Institute of Technology (Caltech, USA) announced that they had found evidence of the existence of a giant planet ‑with a mass ten times larger than Earth’s‑ in the confines of the Solar System. Moving in an unusually elongated orbit, the mysterious planet will take between 10,000 and 20,000 years to complete one revolution around the Sun. In order to arrive at this conclusion, Batygin and Brown run computer simulations with input data based on the orbits of six extreme trans-Neptunian objects (ETNOs). Specifically, these ETNOs are: Sedna, 2012 VP113, 2004 VN112, 2007 TG422, 2013 RF98 and 2010 GB174. In Robert Zubrin's suggested variation of the Kardashev scale, he describes a Type II civilization as one that "has extensive colonies in its respective stellar system." (We're a Type I civilization now, on that scale.) Any such Type II civilization would need all the resources it could get its hands on, and icy worlds full of volatiles are excellent caches of such resources. Planet Nine -- the undiscovered planet at the edge of the solar system that was predicted by the work of Caltech's Konstantin Batygin and Mike Brown in January 2016 -- appears to be responsible for the unusual tilt of the Sun, according to a new study. The large and distant planet may be adding a wobble to the solar system, giving the appearance that the Sun is tilted slightly. "Because Planet Nine is so massive and has an orbit tilted compared to the other planets, the solar system has no choice but to slowly twist out of alignment," says Elizabeth Bailey, a graduate student at Caltech and lead author of a study announcing the discovery. All of the planets orbit in a flat plane with respect to the Sun, roughly within a couple degrees of each other. That plane, however, rotates at a six-degree tilt with respect to the Sun -- giving the appearance that the Sun itself is cocked off at an angle. Until now, no one had found a compelling explanation to produce such an effect. "It's such a deep-rooted mystery and so difficult to explain that people just don't talk about it," says Brown, the Richard and Barbara Rosenberg Professor of Planetary Astronomy. According to the researchers' calculations, such a hypothetical planet would complete one orbit around the Sun roughly every 17,000 years and, at its farthest point from our central star, it would swing out more than 660 astronomical units, with one AU being the average distance between the Earth and the Sun. Scientists think that objects in the Kuiper Belt, a vast region of dwarf planets and icy rocks populating the fringes of our solar system beyond the orbit of Neptune, dance mostly to the tune of the giant planets, Saturn, Jupiter, Uranus and Neptune, influenced by their gravity either directly or indirectly. ASU: Does Our Solar System Have an Undiscovered Planet? Arizona State University astronomer Adam Schneider and his colleagues are hunting for an elusive object lost in space between our Sun and the nearest stars. They are asking for your help in the search, using a new citizen-science website called Backyard Worlds: Planet 9. Astronomers have found evidence for a ninth planet in our solar system. The evidence comes from studying the orbits of objects in the solar system’s Kuiper Belt. This is a zone of comet-like bodies orbiting the Sun out beyond the orbit of Neptune. The Kuiper Belt is similar to the asteroid belt that circles the Sun between Mars and Jupiter, but it lies dozens of times farther out. This hypothetical Planet 9 could be similar in size to Neptune, but it may orbit up to a thousand times farther away from the Sun than the Earth does. So while astronomers can see its effects on the Kuiper Belt objects, no one has yet observed Planet 9 directly. The plane of the solar system is warped in the outer reaches of the Kuiper Belt, signaling the presence of an unknown Mars-to-Earth-mass planetary object far beyond Pluto, according to new research from the UA. An unknown, unseen "planetary mass object" may lurk in the outer reaches of our solar system, according to new research on the orbits of minor planets to be published in the Astronomical Journal. This object would be different from — and much closer than — the so-called Planet Nine, a planet whose existence yet awaits confirmation. n the paper, Kat Volk and Renu Malhotra of the University of Arizona's Lunar and Planetary Laboratory, or LPL, present compelling evidence of a yet-to-be- discovered planetary body with a mass somewhere between that of Mars and Earth. The mysterious mass, the authors show, has given away its presence — for now — only by controlling the orbital planes of a population of space rocks known as Kuiper Belt objects, or KBOs, in the icy outskirts of the solar system. Last year, the existence of an unknown planet in our solar system was announced. However, this hypothesis was subsequently called into question as biases in the observational data were detected. Now Spanish astronomers have used a novel technique to analyse the orbits of the so-called extreme trans-Neptunian objects and, once again, they point out that there is something perturbing them: a planet located at a distance between 300 to 400 times the Earth-Sun separation. Scientists continue to argue about the existence of a ninth planet within our solar system. At the beginning of 2016, researchers from the California Institute of Technology (Caltech, USA) announced that they had evidence of the existence of this object, located at an average distance of 700 AU or astronomical units (700 times the Earth-Sun separation) and with a mass ten times that of the Earth. Their calculations were motivated by the peculiar distribution of the orbits found for the trans-Neptunian objects (TNO) of the Kuiper belt, which apparently revealed the presence of a Planet Nine or X in the confines of the solar system. However, scientists from the Canadian-French-Hawaiian project OSSOS detected biases in their own observations of the orbits of the TNOs, which had been systematically directed towards the same regions of the sky, and considered that other groups, including the Caltech group, may be experiencing the same issues. According to these scientists, it is not necessary to propose the existence of a massive perturber (a Planet Nine) to explain these observations, as these are compatible with a random distribution of orbits. Now, however, two astronomers from the Complutense University of Madrid have applied a new technique, less exposed to observational bias, to study a special type of trans-Neptunian objects: the extreme ones (ETNOs, located at average distances greater than 150 AU and that never cross Neptune's orbit). For the first time, the distances from their nodes to the Sun have been analysed, and the results, published in the journal ‘MNRAS: Letters’, once again indicate that there is a planet beyond Pluto. If a planet is there, it’s extremely distant and will stay that way (with no chance -- in case you’re wondering -- of ever colliding with Earth, or bringing “days of darkness”). It is a possible “Planet Nine” -- a world perhaps 10 times the mass of Earth and 20 times farther from the Sun than Neptune. The signs so far are indirect, mainly its gravitational footprints, but that adds up to a compelling case nonetheless. These are the most recent posts on the dedicated, and detailed, blog that Batygin and Brown maintain regarding the search for planet 9. 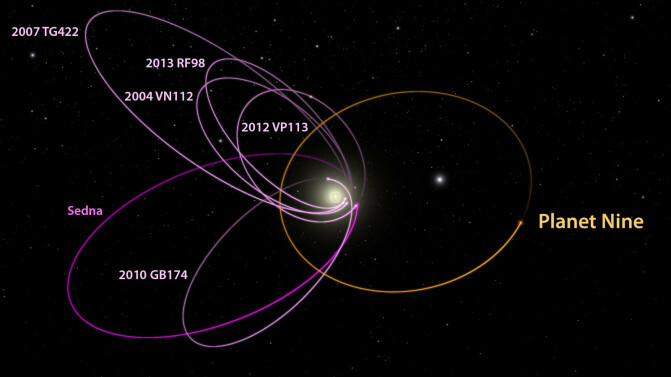 [...]Planet Nine is invoked to explain (1) physical clustering of distant Kuiper belt orbits, (2) the perihelion detachment of long-period KBOs such as Sedna and VP113, as well as (3) the origin of nearly-perpendicular orbits of centaurs in the solar system. Embarrassingly, until recently our understanding of the “machinery” behind how Planet Nine generates these observational signatures has been incomplete. That is, although we have plenty of numerical experiments to demonstrate that Planet Nine can nicely reproduce the observed solar system, the theory that underlies these simulations has remained largely elusive. The good news is that this is no longer a problem. In a recently accepted paper that I co-authored with Alessandro “Morby” Morbidelli, the theory of Planet Nine is characterized from semi-analytical grounds. So, for the first time, we not only know what Planet Nine does to the distant Kuiper belt, but we understand how it does it. The observational census of trans-Neptunian objects with semi-major axes greater than ~250 AU exhibits unexpected orbital structure that is most readily attributed to gravitational perturbations induced by a yet-undetected, massive planet. Although the capacity of this planet to (i) reproduce the observed clustering of distant orbits in physical space, (ii) facilitate dynamical detachment of their perihelia from Neptune, and (iii) excite a population of long-period centaurs to extreme inclinations is well established through numerical experiments, a coherent theoretical description of the dynamical mechanisms responsible for these effects remains elusive. In this work, we characterize the dynamical processes at play, from semi-analytic grounds. We begin by considering a purely secular model of orbital evolution induced by Planet Nine, and show that it is at odds with the ensuing stability of distant objects. Instead, the long-term survival of the clustered population of long-period KBOs is enabled by a web of mean-motion resonances driven by Planet Nine. Then, by taking a compact-form approach to perturbation theory, we show that it is the secular dynamics embedded within these resonances that regulates the orbital confinement and perihelion detachment of distant Kuiper belt objects. Finally, we demonstrate that the onset of large-amplitude oscillations of orbital inclinations is accomplished through capture of low-inclination objects into a high-order secular resonance and identify the specific harmonic that drives the evolution. In light of the developed qualitative understanding of the governing dynamics, we offer an updated interpretation of the current observational dataset within the broader theoretical framework of the Planet Nine hypothesis.